Genetic Alliance UK exists to support and promote the wellbeing of individuals and families affected by genetic conditions. We work closely with our member charities, patients and patient advocates in order to achieve our aims. Our organisation is home to the Rare Disease UK campaign and to SWAN UK – a project supporting families who have a child or young person with an undiagnosed condition of likely genetic origin. Over the course of our lifetimes, 1 in 17 of us will be affected by a rare disease ― that’s 3.5 million UK citizens. Rare diseases include childhood cancers and some well recognised genetic conditions, such as cystic fibrosis and Huntington’s disease. Some rare diseases are vanishingly rare and have names you are unlikely ever to hear, unless you or someone you care for receives a diagnosis. Around 6,000 babies are born each year in the UK who have a ‘syndrome without a name’ ― a rare and probably genetic condition, leading to a protracted diagnostic odyssey and a life challenged by complex needs. Despite their number and diversity, rare diseases have in common that they tend to be complex and difficult to treat. They may be life limiting. The road to diagnosis can be lengthy and difficult. They have in common too the need for multinational collaboration in research ― the sharing of expertise and infrastructure that delivers advances in treatment and hopes of a cure. There are more than 6,000 known rare diseases, and others yet to be identified. No single centre, no single country can provide the specialist expertise necessary to properly meet the needs of every patient with every rare disease. The best outcomes for patients depend upon collaboration across borders. European Reference Networks (ERNs) are the structures that provide for this collaboration, linking approximately 20,000 healthcare professionals in 300 centres of excellence, across 26 countries. ERNs are already delivering benefit to almost a million rare disease patients ― and their future potential is enormous. The NHS provides leadership for a quarter of the 24 topic specific ERNs – and is involved in all but one. That’s 40 UK centres of excellence, and 114 specialist units, caring for approximately 150,000 rare disease patients in the UK. Losing our ability to collaborate and lead as a consequence of Brexit would be to the profound disadvantage of rare disease patients and families in the UK and across the EU. This is why Genetic Alliance UK is calling upon the European Commission and the members of the EU to work with the UK Government to secure sustained involvement of the UK. We must protect the lives and wellbeing of rare disease patients and their families. It would be all too easy for their interests to be lost or marginalised during the course of negotiations. We must not allow this to happen. 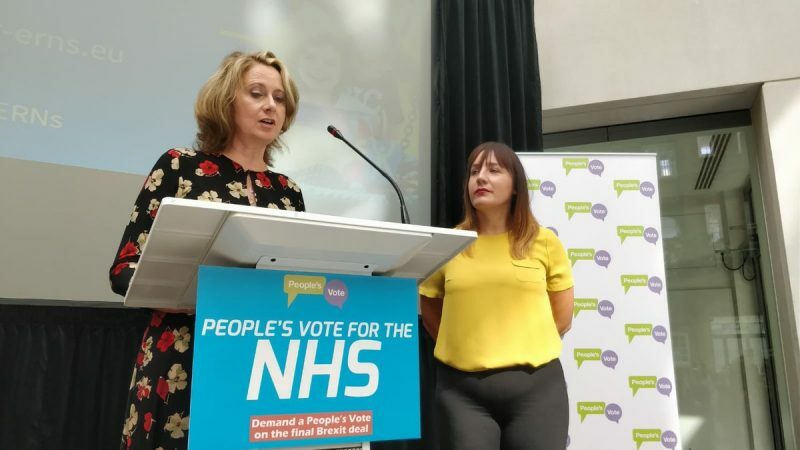 This blog post has been adapted from a speech delivered by Dr Jayne Spink, Chief Executive of Genetic Alliance UK on Saturday 15 September at the People’s Vote rally in London.